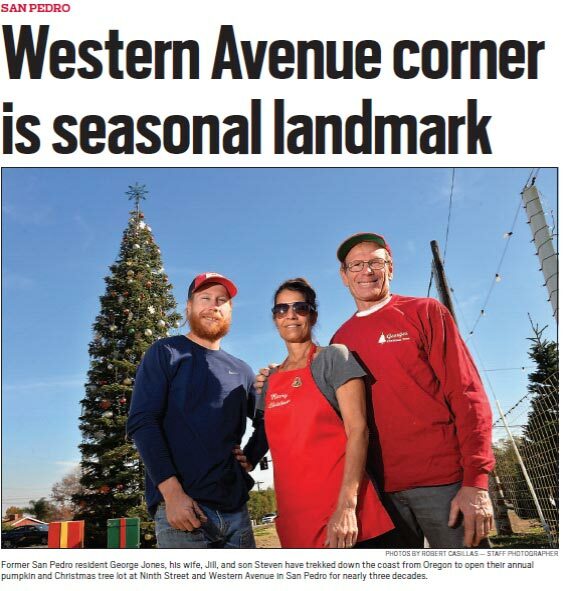 The San Pedro Daily Breeze published a nice article about George’s Christmas Tree Lot at the northwest corner of W. 9th Street and S. Western (CA 213). Wwe’ll be there again this year, from Thanksgiving through Christmas, Daily – 9am – 9pm, so stop on by. If you’d like to learn more about George Jones, the Christmas Tree Guy, and his passion for Christmas and Christmas trees, there is a great article published by San Pedro Today. or you may download the article as a PDF. There is also a nice front page article from the Grants Pass Daily Courier in November, 2008 that you can view as a PDF document. George Jones has other passions as well. One of them is restoring old houses. In 2008, he finished restoring the James Kendall House in Grants Pass. Originally built in 1903, this Victorian home is located in downtown Grants Pass on the corner of 7th and A Streets.